There were actually several options when it came to the “Heavy Rain” recipe, but it all boiled down to one simple “Soup du Jour” in the end. When it comes to a game about origami, I found it very difficult – apparently impossible by the looks of this post’s existence – to avoid a dish involving wontons. Sure, wontons are a Chinese delicacy, and sure, origami is the Japanese art of paper folding, but I threw off my prissy pants and made the leap. If Hollywood can do a remake of “The Karate Kid” in China where our new hero learns kung fu at the hands of Jackie Chan (which roughly translates into: Jackie Great Kung Fu Awesome), then dammit, I can make a Chinese soup to reflect an aspect of the Japanese culture as reflect in a vidja game. Before you get rolling on this recipe, there are a couple things you should know about wontons. Other than the fact that there are a bajillion ways to make them, there is only one set of tools you will need: your handy-dandy fingers. So, jog your fingers in place a bit, work them up to a good sweat, and get ready. Indulge in a little light crrrrrushing. Okay, seriously? It’s not that bad. Just follow these simple directions, keep your little water bowl close by, and don’t worry about messing up! The wonton seal isn’t permanent. You can either make sure it’s sealed, regardless of misshapen atrocity, and try your hand at the next one, or you can pry apart the bugger and have another go. This breakdown from noobcook.com is excellent! 1/2 lb cooked pork, course chop. 1/2 sweet onions, cooked until soft. 1/2 red pepper, cooked until soft. 2 clove garlic, cooked until soft. Cook the peppers, onions, and garlic until they are soft. Combine these three ingredients with your chopped, cooked pork in a blender or food processor. Pulse for a few rounds until combined. Add the honey, rice wine, soy sauce, and ginger. Continue to pulse until blended. 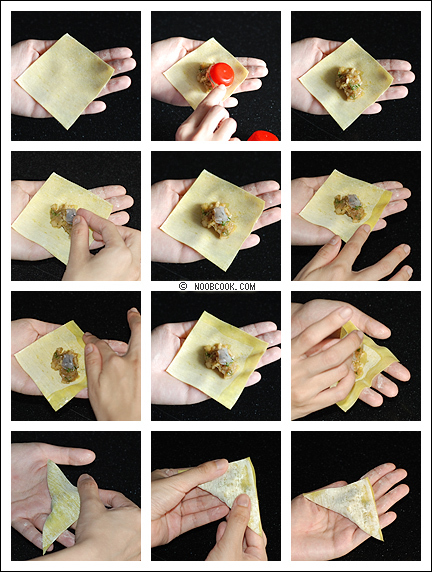 Now, when building your wonton dumplings, follow the steps in the picture above this recipe. You only need about a teaspoon of filling per dumpling. 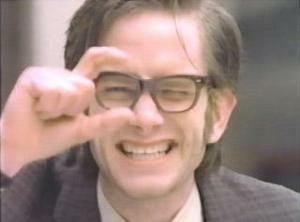 Make sure you wet all the edges with your fingertip, and press firmly for a good seal. Work the seal out and away from the meat, ensuring good riddance to bad air bubbles. Take this extra precaution, or it’ll be like a mini-mince pork bomb went off in your soup! 1 cup shitake mushrooms, julienne. Bring the chicken broth to a boil, and add the fish oil. Next, add your wontons, the mushrooms, and the green onions. Let all of this cook for about 10 minutes, or until wontons are done. The most labor you will do with this recipe? Building your wontons. Honestly, you can do that the night before, and then make your soup the next day. Any leftover wontons taste delicious fried up in some sesame oil, topped with roasted sesame seeds and served with a side of buttered ginger broccoli. Yum!